Today I have a secret recipe from Joe’s Crab Shack. This beach-themed seafood restaurant recently closed several locations across the country. Lucky for us, we have some great secret recipes so you can enjoy your favorite Joe’s recipes at home. The BBQ crab legs are first steamed, then covered in a tasty spice mixture and of course served with plenty of melted butter. In a large stock pot, bring a large amount of water to a boil. Place the crab legs into the water and boil until opaque and flaky. Remove the crab legs from the water and cut a slit into each of the leg shells. In a small bowl, stir together the pepper, garlic salt, paprika, Old Bay seasoning, and salt. Add the vegetable oil and stir well. Brush the mixture onto the crab legs prior to serving. Melt the 1/2 stick of butter and serve alongside the crab legs. 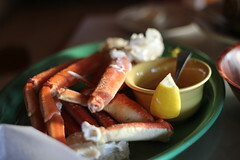 Today’s secret recipe is for one of the most popular appetizers served at Joe’s Crab Shack. 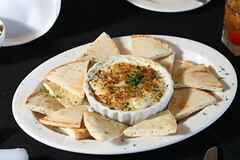 Their blue crab dip is full of flavor and ridiculously easy to prepare. For the best results, use fresh crab meat. For a healthier version you can substitute low fat cream cheese. Enjoy this before dinner or serve it for friends the next time you have a party. Once you try these, you’ll see how addictive they can be. In bowl, combine first 7 ingredients. Mix well. Transfer to oven safe dish (preferably a wide dish so that the dip is only about an inch deep); sprinkle with Parmesan cheese. Place in preheated broiler; broil for a few minutes until the top begins to brown a bit. Today’s secret recipe is another sneak peek of one of the fantastic recipes that will be included in the new cookbook. At Joe’s Crab Shack they serve a delicious crab cake that is perfectly seasoned. This easy-to-follow recipe will show you how to recreate this dish at home. You can get your copy of the new cookbook which features 150 of our best recipe clones on Friday, November 29th. This book will sell out, so act fast next Friday. 1. Beat together the first nine ingredients. 2. Fold in the bread crumbs and parsley. 3. Fold in the crabmeat. 4. Form into 4 to 6 patties. 5. Lightly coat the patties in flour on both sides. Refrigerate for at least 30 minutes before frying. 6. 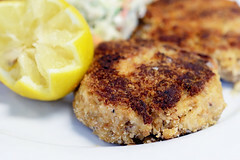 Deep-fry the crab cakes in 350°F oil (use just enough oil to cover the crab cakes) until browned. 2) Amazing Cakes That Are Better & Cheaper Than The Bakery! 3) Eliminate Your Migraine Pain Forever! There’s been a buzz around my town about rumors of Joe’s Crab Shack moving in. Besides their delicious seafood dishes and steampots, you have to love their quirky TV commercials. With today’s secret recipe, you can easily prepare Joe’s famous popcorn shrimp at home. These crunchy, golden fried shrimp make an excellent appetizer that are fun to eat. Place shrimp in a bowl, add garlic powder, brown sugar and Tabasco Sauce and mix well. Marinate shrimp for 1/2 hour in refrigerator. Beat egg and add water, blend well, set aside. Mix flour, cracker meal, bread crumbs paprika and Creole seasoning together and blend well. Assemble for frying of shrimp, one bowl for corn starch, one bowl for egg wash, and one bowl for cracker mixture. Heat oil for frying, use your favorite form of deep frying. One piece at a time dust shrimp with corn starch, then place lightly in egg wash then roll in cracker crumb mixture. Fry until done. Shrimp will float to top when cooked through, remove when done and place on paper towels. Serve with your favorite tartar or cocktail sauce. 2) Make The Best Barbecue Anyone Has Ever Tasted! 3) Save Up To $500 Or More On Your Next Flight.